At Medicap, our focus is on your health and wellness. Talk to our pharmacist about using compounding to tailor your medication to your unique needs. Together with your doctor, we can find a treatment that works for you. Medicap Pharmacy is proud to say that it is PCAB Accredited. PCAB accredited pharmacies have gone the extra mile to demonstrate that they comply with nationally accepted quality control, quality assurance and quality improved standards. This helps assure that the patient receives a quality medication. At Medicap Pharmacy, quality is our only standard. Only about 2% of compounding pharmacies are PCAB Accredited. We believe your health and safety are worth it. 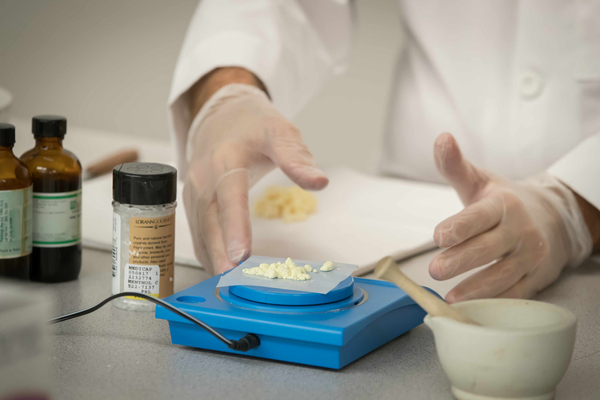 Our staff has undergone extensive training in compounding techniques to prepare specialized medications using chemicals and equipment not found in traditional retail pharmacies. We can personalize your medication when there is a need for specific strengths or flavors, or to exclude ingredients from medication due to allergies or other sensitivities to lactose, preservatives, dyes, gluten or sugar. We often get referrals from local pharmacies. A traditional pharmacy like Rite Aid, CVS, Walgreens, Walmart, and others don't have the time or equipment to properly make these preparations. We do and we can always take care of these prescriptions. No two women's hormone needs are alike, for example, so we can provide a broad range of customized strengths and forms of bioidentical hormones to meet every situation through BHRT (Bioidentical Hormone Replacement Therapy), the most commonly compounded medication. Bobbie Barbrey is experienced in BHRT and can assist the patient and the healthcare provider to interpret the results of serum, urine, or saliva tests which measure a patient's hormone levels. The healthcare provider and the patient can use the results of these tests to help determine a course of treatment which will give the patient the appropriate amount of hormones her body needs. As any pet owner is well aware, animals can be extremely difficult to treat with medications. Cats are notorious for refusing to swallow pills, and usually will eat right around one disguised in food. One solution would be to compound the medication into a topical preparation to rub in the cat's ears.